Full Automatic Wireless Car Charger Qi Fast Charging Holder. 7.5W fast charging for iphone X 8/8 Plus. Please don't put over 0.12 inches thickness case , metal ring holder, metal plate sticker and Pop Sockets on your phone. Please keep it away from water or other liquid, power off before cleaning it. 5.When you need to take the phone out, you can just touch the sensor button on left side then the clips will open automatically, and then you can take it out. 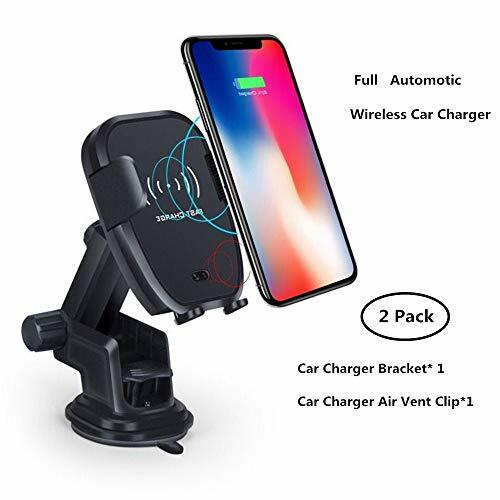 Easy to use - This car charger holder is super easy to use according to smart gravity linkage; Just put on your phone, it will clamp automatically and align the phone with wireless charging sensor. Intelligent Protect Technology - The wireless car charger mount is built-in intelligent chips provide over-current protection, short circuit protection, over temperature protection, making sure ultimate safety for your phone. High-speed wireless charging - The fast wireless car charger adopts high charging efficiency upgraded independent coil, Quick-charging speeds with up to 10W of power. If you have any questions about this product by Be-one, contact us by completing and submitting the form below. If you are looking for a specif part number, please include it with your message.